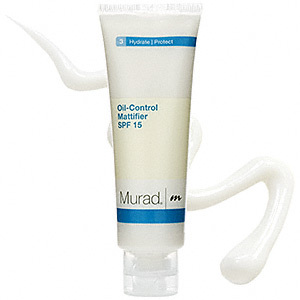 Murad Oil Control Mattifier - Oily skin can be a huge problem for some. Too much sebum production sometimes feels like a curse. Well, mother nature intended for our sebum production to work for us not against us. See, normal oil production lubricates and protects our skin. Unfortunatly, too much sebum is a real problem. It leaves our skin feeling uncomfortable and embarrassing. So... what can help? Stated on the Murad Website, The Murad Oil Control Mattifier "reduces shine on contact and keeps skin free of excess oil by up to 78% for 8 hours." Murad uses a blend of botanicals to eliminate shine issues and banish blemishes. It also contains SPF 15 for sun protection. Message over entire face evenly. Apply a conservative amount to a clean face. Water (Aqua), Cyclopentasiloxane, Bis-PEG/PPG-14/14 Dimethicone, Dimethicone Crosspolymer, Corn Starch Modified, Butylene Glycol, Chitosan Ascorbate, Polyglyceryl-3 Polydimethylsiloxyethyl Dimethicone, Triethoxysilylethyl Polydimethylsiloxyethyl Hexyl Dimethicone, Farnesyl Acetate, Panthenyl Triacetate, Argania Spinosa (Argan) Kernel Extract, Serenoa Serrulata (Saw Palmetto) Fruit Extract, Sesamum Indicum (Sesame) Seed Extract, Punica Granatum (Pomegranate) Seed Oil, Sodium PCA, Betaine, Sorbitol, Glycine, Alanine, Proline, Serine, Threonine, Arginine, Lysine, Glutamic Acid, Capryloyl Glycine, Sarcosine, Cinnamomum Zeylancium Bark Extract, Aluminum Starch Octenylsuccinate, Acrylates Copolymer, Magnesium Carbonate, Melaleuca Alternifolia (Tea Tree) Leaf Oil, Tocopheryl Acetate, Lauryl Methacrylate/Glycol Dimethacrylate Crosspolymer, Dicaprylyl Ether, Niacinamide, Yeast Extract, Aesculus Hippocastanum (Horse Chesnut) Seed Extract, Titanium Dioxide, Algae Extract, Ammonium Glycyrrhizate, Panthenol, Zinc Gluconate, Caffeine, Xanthan Gum, Acrylates Crosspolymer, Polyglyceryl-2 Dipolyhydroxystearate, Biotin, Salix Alba (Willow) Bark Extract, Aminomethyl Propanol, Disodium EDTA, Sodium Chloride, Propyl Gallate, Phenoxyethanol, Chlorphenesin. "Has been an oil control lifesaver for me." "I really cannot be without this product. I live in a hot and humid climate and this keeps my skin dry all day." "It goes on smooth and absorbs quickly." "It does break me out a tad, but it keeps the shine under control." "I have tried everything and this is the only mattifier that works."